Finely chop black olives, capers, dried tomatoes, and basil. Combine feta with yogurt, then fold in olives, capers, dried tomatoes, chopped basil, and add olive oil. Stir to combine and season with salt and pepper. Cut baguette into slices and brush with olive oil and garlic. Heat frying pan and toast baguette slices on medium-high heat on both sides approx. 2 – 3 min. each, or until golden brown. Take out and set aside. Heat olive oil in pan, add prawns, season with salt, and fry on both sides for approx. 1 – 2 min. Add lemon juice, rosemary, and garlic and fry for approx. 1 min. Remove from heat. 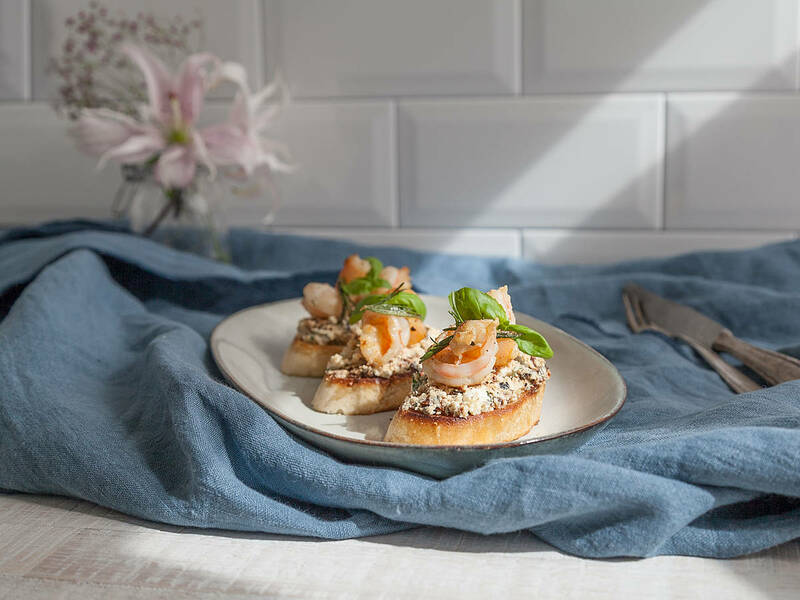 Spread feta cream on toasted baguette slices, top with fried prawns, and serve with more basil. Enjoy!